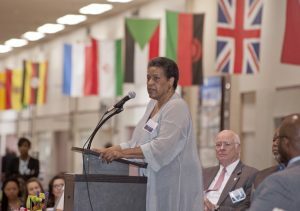 On Friday, June 13, the University of Mississippi Medical Center (UMMC) honored the legacy of Myrlie Evers, by establishing the Myrlie Evers-Williams Institute for the Elimination of Health Disparities. Mrs. Evers’ commitment to providing healthcare opportunities for underserved people of color inspired her to lend her name to the UMMC Evers-Williams Institute for the Elimination of Health Disparities. The newly renamed institute represents a partnership between UMMC and Jackson State University, aiming to improve geological minority health disparities. Celebration attendees included Congressman Bennie Thompson, Senator John Horhn of Jackson, Mayor Tony Yarber, among others.